Berries are important part of a healthy lifestyle. Most people are aware of their antioxidant properties and how nutrients dense they are, yet a lot of people struggle to incorporate them into their diet. 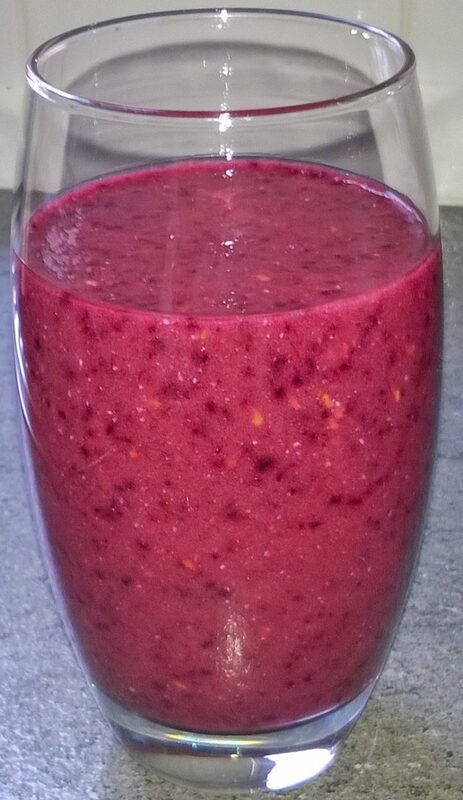 This simple Very Berry Smoothie recipe can help make it easier. Have for breakfast, lunch or part of afternoon snack. 1 Put all ingredients in a blender or smoothie maker and wiz for about 20 seconds until smooth. 2 Pour into a glass and enjoy. Blueberries are full of anti-oxidants and are rich in fibre, vitamin-C, vitamin-K, manganese which help against heart diseases and cancers, helps with anti-aging, brain function and is also anti-inflammatory and reduces muscle damage. Raspberries are rich in fibre, vitamin-C, vitamin-A, vitamin-E, vitamin B-6 and copper which is required to produce red blood cells. Blackberries contain folic acid, vitamin-A, vitamin-C, vitamin-E, vitamin-K and has anti-aging properties. Red currents maybe small but are packed with potassium, fibre, vitamin-C, vitamin-B and magnesium which is good for your nerves, good for your skin and boosts your red blood cells. Mango keeps cholesterol in check, it is great for your skin, regulates diabetes, helps with weight loss and digestion, aids concentration and memory and it is great for your eyes. It contains fibre, iron, calcium, vitamin-C, vitamin-A, vitamin-E and pectin. Pineapple is packed with vitamin-A vitamin-C, calcium, phosphorus, fibre and potassium. It prevents coughs and colds, strengthens bones, keeps gums healthy, helps with arthritis with its anti-inflammatory qualities and improves digestion. Kiwi fruit decrease the risk of heart disease and cancers, reduces constipation and improves protein digestion. It contains fibre, vitamin-C vitamin K-1, vitamin-E, potassium, copper and vitamin-B9. Chai seeds are a great source of omega-3, fibre, protein, lowers cholesterol and is an anti-oxidant.